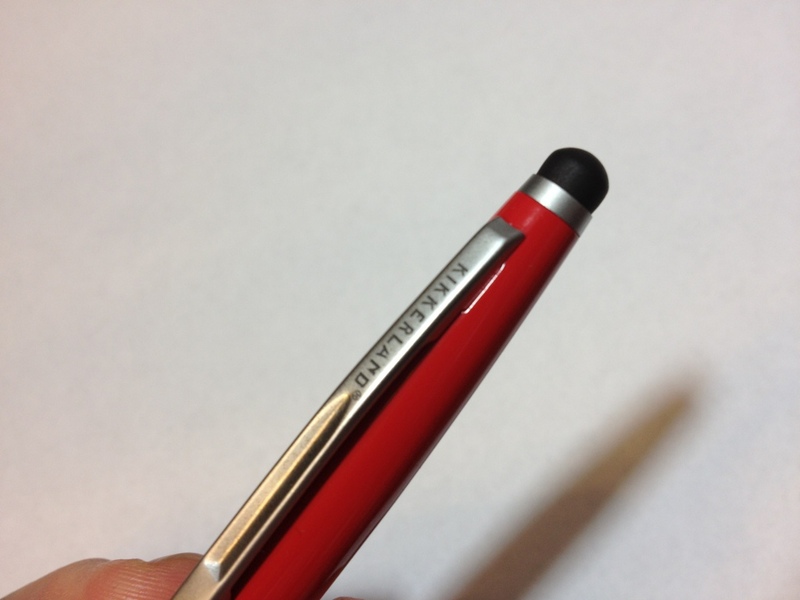 A while ago, I reviewed the Bic Tech Ballpoint and Stylus pen. That was one of the first pen/stylus combinations I encountered that were actually purchasable for me (I live in the middle of nowhere). 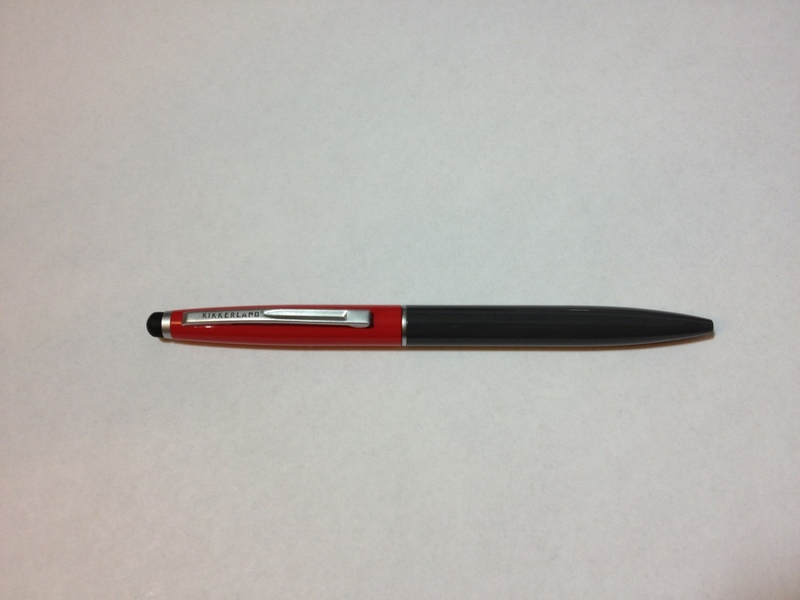 Recently another of the same type of pen was given to me: the Kikkerland Retro Ballpoint and Stylus. And I like these types of pens, so let’s see how this one preforms. The style of the pen is “retro” and it comes in three color combinations, two of which I wouldn’t consider using, while I think the third, red and grey, looks quite nice. The pen is fairly torpedo shaped, with both ends tapering down and the widest point being in the center, where there is a small center ring that divides the two body colors and metal sections. There is an almost unusably tight clip that says Kikkerland near the top, followed by a small ring with the smallish stylus point on top. Beyond that, there is no information or other markings on the pen. The paint is plain and smooth, slick enough that it almost slides out of the hand at times, but durable. The mechanism is a twist one. 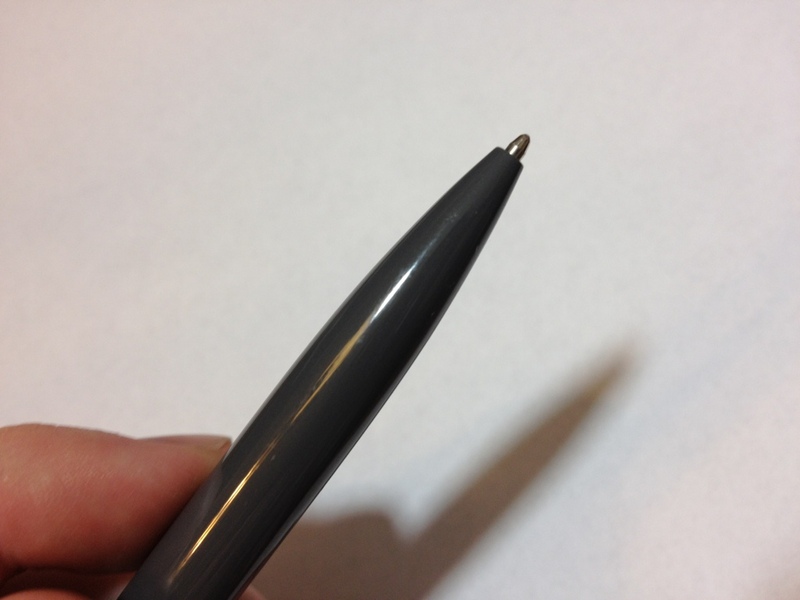 It is quite smooth, almost too smooth, as pushing too hard on the pen may reverse the action. The default refill is a Cross type in medium, I’d likely buy Cross refills myself. The pen writes rather smoothly and has little in the way of startup problems, but a bit in the way of blobbing problems. It is good for short notes, but for longer writing likes to smudge and blob. It is, like most ballpoint inks, fairly water resistant. Flipping the pen around gets you to the stylus which is a bit smaller and more precise than the Bic one mentioned earlier. It is still slightly mushy and I think these smaller styluses need work before I will thoroughly enjoy using one, but this is the most responsive one I’ve tried. Again, there are a few problems, but I have no difficulties using this to operate my phone, and carrying it around to jot down ideas in Adobe Ideas. Overall, the pen is on par and the stylus is slightly above-average. I’d make sure the colors and styles work for you before getting it, and replace the cartridge with a Cross refill. After that, it should easily serve well. The metal in the body is sturdy and the paint resists chipping, though it does chip near the tip. It isn’t the greatest pen ever, and it won’t last forever, but it is certainly better than much of the competition for not a bad price.